Bloomex - Order Flowers Quickly and Securely for Canada Delivery :: Order from a Trusted Canadian Online Florist - Win a $50 GIFT CARD for THANKSGIVING! Win a $50 GIFT CARD for THANKSGIVING! Thanksgiving is almost here in Canada! Thanksgiving is a time to unwind and reconnect with those we care about. Many of us are fortunate enough to enjoy a turkey dinner in a warm home, and to take time to visit with family and friends this holiday. Thanksgiving also provides us with a wonderful opportunity to reflect on the things we are thankful for. This includes the people in our lives who matter most—the ones who boost our spirits, cheer us on, make us laugh, or help pick up the pieces when things go badly. We may also be thankful for good health, for a job we enjoy, a dream vacation, or any number of other blessings in our life. What are you thankful for? Send us a short note telling us. The top two entries will win a $50 Gift Card from Bloomex! Your story can make us laugh or make us cry, but so long as it moves us you can win! You can use your $50 Bloomex gift card toward ANYTHING YOU LIKE on the Bloomex site! Have your gift delivered to yourself or to someone else. 2) Send your note to contest@bloomex.ca, either in the body of the email or as an attachment. Please include the words ‘THANKSGIVING CONTEST’ in the Subject Line of the email. 1. By submitting your story and/or photos, you agree that they become, as submitted, property of Bloomex, and allow Bloomex to post your submitted materials publicly on sites including but not limited to www.bloomex.ca, the Bloomex blog (bloomex.blogspot.ca), and the Bloomex Facebook page. Bloomex is happy to provide only first names of people involved in the stories; please let us know if you would like us to do this. 3. DEADLINE FOR ENTRIES is Tuesday October 14, 2014, at 9 p.m. Eastern Standard Time. 4. Two (2) winners will be chosen, with each winning entry receiving A $50 GIFT CARD card to be used toward any purchase of their choice on www.bloomex.ca. 5. Contest open to residents of Canada. 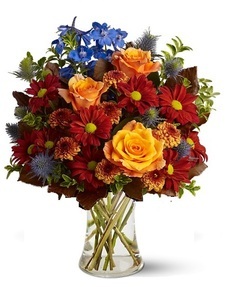 Send your entries today, and earn a beautiful bouquet for being thankful!